Can you start by telling us about the CMO Survey – it’s purpose, and when you started it? I started the survey in August 2008 and have administered it twice a year since. Our mission is to collect and disseminate the opinions of top marketers in order to predict the future of markets, track marketing excellence, and improve the value of marketing in firms and society. The CMO Survey covers a range of strategic marketing questions, many of which are forward-looking. We repeat questions to observe trends over time. Given it is a non-commercial service dedicated to the field of marketing, the survey is an objective source of information about marketing—we cover the good, the bad, and the ugly. I started the survey because I felt there was a lack of attention to what marketing leaders know and have to offer one another, the profession, and the broader business world. By collecting their opinions, their practices, and their spending behaviors, we have been able to get important insights into how to improve the contributions of marketing. What are some of the more interesting insights you’ve observed lately? One topic I’ve written about on our blog is the Social Media Spend-Impact Disconnect. What we mean by this is exactly like it sounds like: social media is not delivering the goods. Social media spending is expected to climb to 20.9 percent share of marketing budgets in the next five years. This share was only 5.6 percent in 2009. 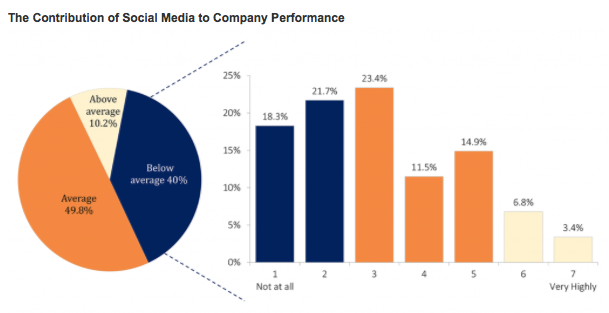 What is striking, however, is that only 3.4 percent of marketing leaders report that social media contributes very highly to firm performance; 40 percent report a below average contribution. This is worrisome. We see that hot topics like social media are often disjointed from the firm’s strategy. Many companies do not have clear objectives for their social media activities. Without objectives, what should be measured? The best social media activities have a clear objective and measure performance against this objective. However, companies often don’t clearly specify their objectives and so strategy and measures are not clear. We also see cultural challenges. As companies build a presence in social media, they often seek outside agencies to help. In fact, marketing leaders report that 20 percent of their social media activities are performed by outside agencies. One challenge is that old “not invented here” syndrome—where companies fail to accept new ideas developed outside their borders—could be keeping this external expertise from making its best contributions. The CMO Survey reports that companies currently spend 6% of marketing budgets on mobile marketing and that this investment level is expected to increase to 15.6% over the next three years. This 160% increase reflects a growing reliance on mobile to interact with customers where they look for information and make purchases. Companies hope to reach customers closer to the time of purchase in order to make them aware of offerings, deals, and additional information that may help close more sales. Despite these hopes, marketing leaders report only modest success in the impact of mobile marketing activities. 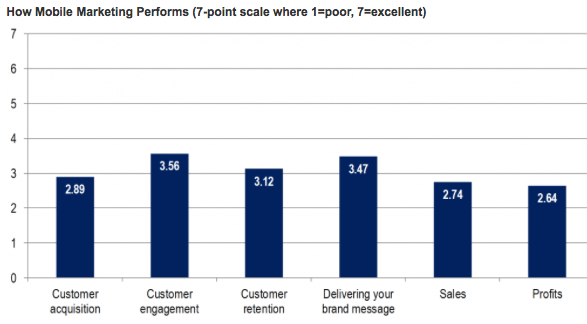 When asked to rate the performance of their company’s mobile marketing activities on a scale from 1-7 where 1=poorly and 7=excellent, the figure below shows the current gap with only customer engagement breaching the halfway mark, while delivering your brand message, customer acquisition, customer retention, sales, and profits all falling below average. What is critical is that companies ask themselves a few important questions before embarking on their mobile expansion plans: Who is the customer? How do they shop? Is this a high-involvement purchase? For example, a middle-aged car buyer will spend very little time searching on a mobile device. Like any channel, mobile must suit your offering and your customer. What about tracking and privacy? How are leading marketers balancing the short-term pressure from sales with their long-term objectives? The CMO Survey reported that 40 percent of companies use customer information collected online for targeting purposes and 88.5 percent of Chief Marketing Officers expect this practice to increase over time. At the same time, CMOs have very low levels of concern about how the use of online customer data infringes upon privacy. These numbers are not reflected in the marketplace. For example, a survey by the Pew Internet & American Life Project found that 86 percent of Internet users have taken steps to remove or mask their digital footprints — ranging from clearing cookies to encrypting their email. Fifty-five percent have gone even further to avoid being observed by specific people, organizations or the government. Clearly, customers and marketers are not on the same page. It is time for companies and industries to proactively create strategies, systems and standards for interacting with customers online. Companies should let customers decide how much they want to share in return for more customization and targeting. In a strong relationship, customers will likely disclose a great deal because they trust companies and understand the value of sharing information about their preferences and behavior. Think reciprocity. When this happens, it’s a win for customers and a win for companies. It is also a win for society because commercial relationships are based on respect and reciprocity, not ignorance and secrecy. Thanks, Professor Moorman. I expect our readers will download The CMO Survey reports, and stay tuned for updates.